In this section, we will get Vert calibrated for your horse and set up for your riding preferences. It will take about 10 minutes. Vert should be attached to the headpiece of your bridle before you put the bridle on your horse. Once Vert is securely attached, put the bridle on the horse and slide Vert to the middle of the crown piece. Angle sensing works best when the bridle is flat to the head. If your horse does not have a bridle path, Vert may be inaccurate from one ride to the next, as the underlying mane shifts around. 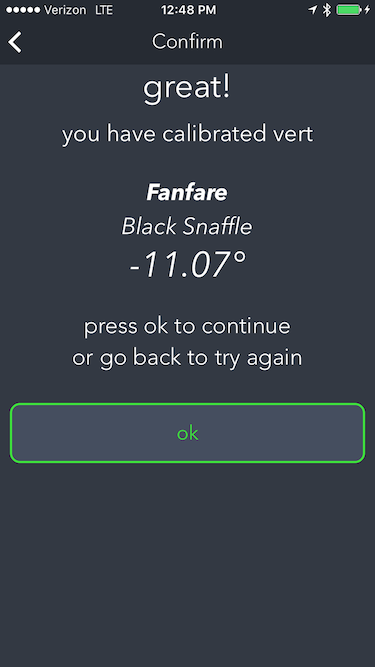 The first time you launch the app, you will be asked to calibrate Vert. Calibration is a one-time setup process that is necessary so that Vert “knows” what vertical is for each horse and bridle combination. It is a combination of measuring the shape of your horse’s head, and a way for you to decide what vertical looks like for your horse. 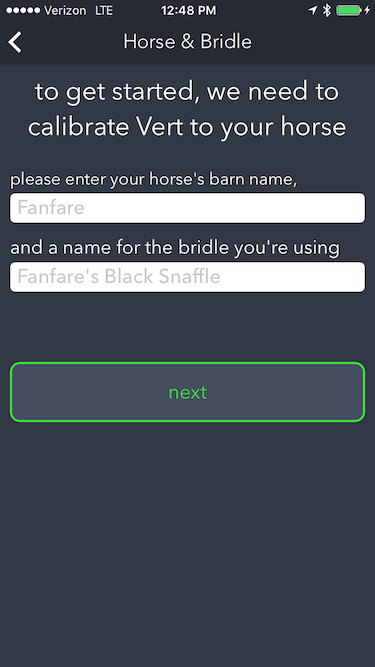 When you begin, a screen will appear asking you to input the name of the horse and bridle. Next is the actual calibration process, and for that you will need two people; one to handle the phone and one to handle the horse. 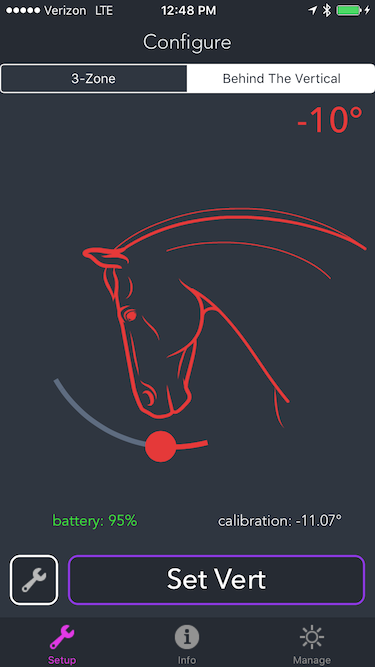 During the calibration process, the phone need to be held fairly close to the horse due to the short range of Bluetooth. Staying within about 10 feet of the horse should let you judge the vertical while being close enough for the phone to talk to Vert. During the calibration process, for maximum accuracy, adjust the horse’s vertical head position (high, long-and-low, etc.) so that it is as close as possible to the frame you want when riding. Congratulations! You are now done with the hard part. 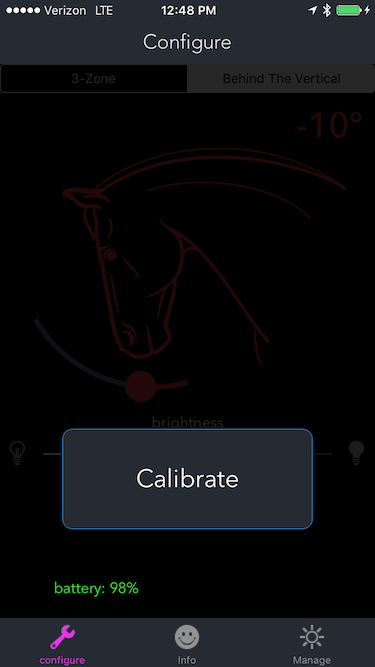 The calibration for your horse is now stored on your phone. There are 2 modes to choose from on the main configuration screen. The active mode is white. To change between modes, just tap the one in black. This mode is useful as a kind of “alarm” which is triggered if the head moves through the minimum angle. This mode is useful to give constant feedback about the current position. 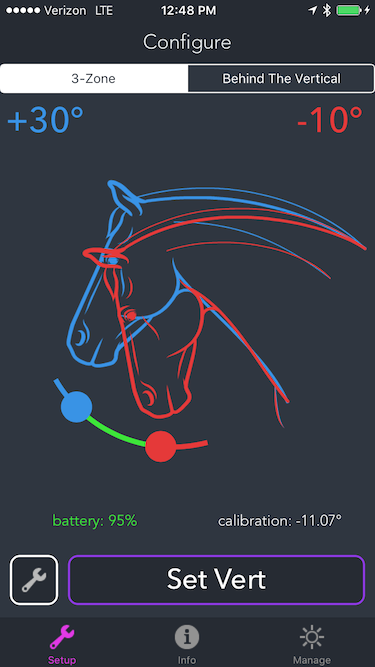 In either mode, you may adjust the desired angles by using your finger to move the dot corresponding with a given angle; you can watch the shape of the horse’s head and neck change, and see the numeric display change. At the bottom of the screen is a button with a wrench to adjust other options, including the brightness of Vert’s display. In general, you will need to use a brighter light when there’s more ambient light, e.g. on a sunny day. Start with the brightness set at 50 and adjust up or down as necessary. It’s a good idea to keep the brightness as low as possible to save battery life. 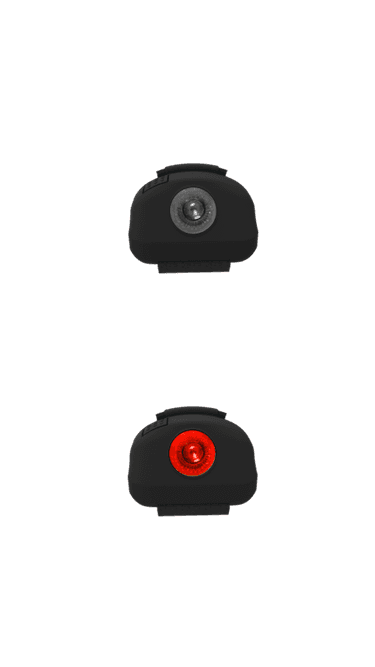 You may also use the brightness to suit your own training preferences; Vert can serve as a quiet nudge or a more demanding presence. 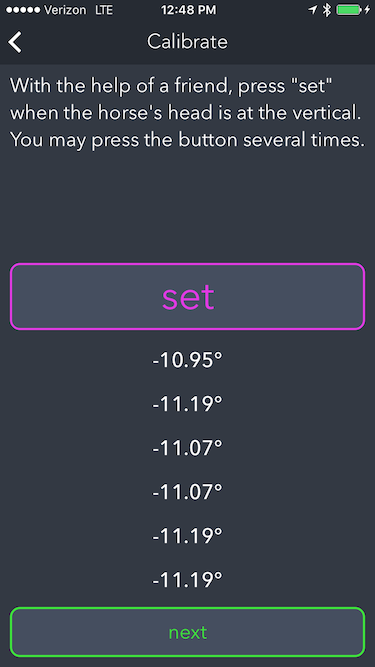 Once you have selected a mode, chosen your angles, and decided on a brightness level, you must press the SET button to save the new settings in Vert. When the set button is pressed, the screen darkens, and Vert flashes purple, then flashes white twice. It is then ready to be used independent of the app. 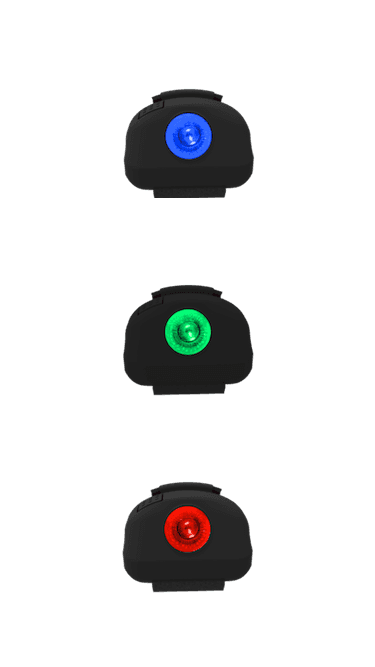 Then you can then simply use the on-off button on Vert at the beginning and end of your rides, and leave the phone behind. 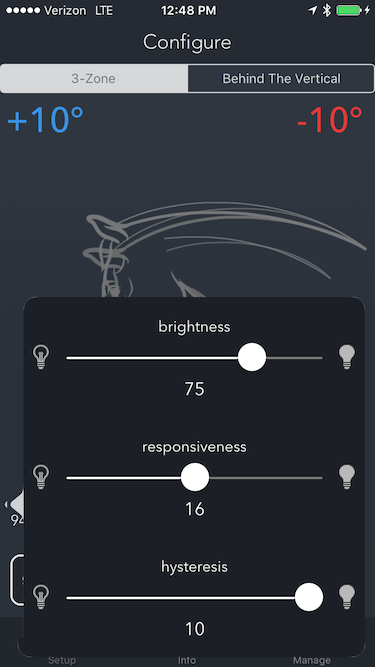 to save battery life, turn Vert on after you’re done with longeing, warmup, etc. please note that Vert may be distracting until you are used to incorporating the feedback it gives you. the first few times you use it, try make sure there are no other riders in the arena. in other words, you may get fixated on the blinky lights and forget to steer. however, the effect wears off quickly. We recommend charging Vert briefly before each ride. Some folks plug it in while grooming and tacking, others charge it in their car on the way to the stable. We built this for you to use, and we would love to know what you think. Does Vert do what you think it should? What settings work for you? Which mode (behind-the-vertical or 3-zone) is more helpful? What could we add or change? After 15, 30, 90 minutes of using it, how has your opinion changed? How can these instructions be improved? copyright © 2018 equla llc. all rights reserved.